When we talk about literacy, we broadly describe our ability to read and write. I know I'm grateful for this ability, and I do what I can to help my girls develop literacy skills, too. In fact, we celebrated International Literacy Day on Sept. 8 by playing. If you're wondering what play has to do with literacy, consider how play activities help our kids learn about sounds, words, language, and stories. With these skills, our kids build a foundation for the development of reading and writing abilities. For these reasons, let's encourage our kids to play more so they can become more literate. 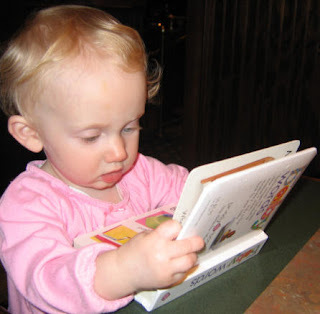 Here are several ways play promotes literacy from an early age. From babbling at the mobile above the crib to singing along with their favorite kids' music, children use sounds and words as they play. All of this oral communication paves the way for literacy skill development. Through play, our kids listen, speak, discuss roles, describe objects, give directions, learn new vocabulary and word meanings, and constantly reinforce their communication and oral language skills. They then use these skills to read, write, and comprehend language better. Reading and writing require numerous cognitive skills, such as categorizing, imaging, and problem-solving. Our kids develop these abilities as they play. I know that when my girls play make-believe, use trial and error in their artwork, and create their own game rules, they're honing essential cognitive abilities that support their literacy achievements. Written words represent spoken words, and children prepare to make this and other literary associations as they play. As they use props, act out new themes, take on pretend roles, and work with visual arts, they learn more about symbolism and expand their vocabulary and use of language. For example, my girls sometimes form pretend food from play dough, use paper tubes as binoculars for a spy mission, or improvise dialogue for their make-believe characters. Their symbolic use of objects prepares them to accept that written letters have sounds and that we can put letters together in a string to make words, essential skills for literacy development. The social interactions our kids enjoy as they play help them construct spoken language skills that form the foundation for literacy development. They gain an understanding of human interaction, how language works, and word meanings as they communicate with peers and adults during play. Those skills allow our kids to then connect spoken language with written language as they read and write. Academic learning and literacy development depend in part on a child's ability to self-regulate. Over the years, I've observed how delayed gratification, patience, and perseverance have helped my girls complete challenging reading and writing tasks. In part, they learned these self-regulation tools as they played. Stacking blocks, sharing toys, and practicing throwing a ball are examples of play activities that support literacy success. Our playroom at home is a literacy-enriched environment. My girls have access to drawing materials, board games, and books. I also encourage them to write signs and menus for their pretend restaurant and label their toy bins with the names of the items inside. This play setting reinforces their writing and reading functions while associating literacy with fun. As adults, we can provide the necessary tools for this setting and surround our kids with literacy-enriched props. To celebrate International Literacy Day and every day, let's encourage our kids to play. They can have fun as they learn basic skills that support literacy development. In what ways does play help your kids learn to read and write?